Small Breed Dog Food – Is A Specialist Diet For Small Breeds Worthwhile? Small dog breeds have specific, specialist nutritional requirements. In the case of a small breed puppy, their stomach is not large enough to hold sufficient food in one feeding to provide his daily nutritional needs without causing stress to their system, so smaller, broken down meals are advised. This is why some commercial dog food suppliers are now providing dog owners with the option of specialist small breed dog food. When a puppy graduates from mother’s milk to solid food at about six weeks of age, he will require three to four meals a day, with the exception of Toys, who may need four to six meals. When he reaches about four to five months old, twice-a-day feedings may be sufficient. He can graduate to once-a-day meals at eight to nine months of age. A pup’s nutritional requirements for growth and development are greater than those for an adult dog. If you opt to feed your small dog breed pup a commercially prepared diet try to ensure it is a feed specially formulated for puppies and enables the youngster to get the full range of nutrients he needs. A small dog breed pup who eats a complete and balanced commercial puppy diet – whether it is a small breed dog food prepared diet or another puppy formulated specialist food – doesn’t need additional supplements. Adding supplements can cause nutritional imbalance as most modern commercial dog foods are prepared to contain all required nutritional elements your small breed puppy will require in this important growth stage. However, if you are supplying your dog with a home-cooked or fresh-diet meal plan, supplements may be necessary. Consult with a veterinary nutritionist to get further advice. Dry food can be moistened with warm water to encourage puppies to eat. Milk can be used, too, but only in extremely small amounts. Goats milk for puppies is often favoured by many breeders. Cow’s milk causes digestive upset in some puppies and dogs. A tablespoon of canned food can be added to increase interest, as well. These are general guidelines for feeding your small dog breed pup; consult with your veterinarian for more specific advice. If your pup doesn’t appear to be developing as you believe he should, feeding small breed dog food without first consulting a specialist in the area of dog nutrition would not be advised as your dog may have underlying problems that need to be investigated by a professional expert first. Feeding Adult small dog breeds: The adult small dog breed is a mature dog, usually age one year or older. Healthy adult dogs who are not pregnant, nursing, or hardworking have somewhat low nutritional requirements. Feeding is fairly straightforward if you’re feeding commercially prepared kibble. Buy a complete and balanced diet made for the adult dog and give your dog the recommended amount once or twice a day. Add a tablespoon of canned food for taste if you wish. 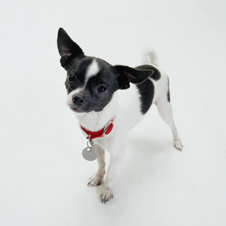 Adjust the amount according to the small dog breed’s activity level and body condition. Feeding Hardworking small dog breeds: Highly active small dog breeds use a lot of energy. The hard-working dog can require two to three time more kilocalories per pound of body weight than what is required for normal activity. To maintain good body condition and keep up his stamina, the hardworking small dog breed must eat a high-energy diet. Many veterinarians recommend commercially prepared “performance” diets for highly active dogs. Higher fat, higher-protein diets supply the working dog with needed calories. Because performance diets are higher in protein than maintenance diets, there s a misconception that the active dog just needs extra protein. However, all nutrients are required in greater amounts. Additionally, research indicates that moderately high-protein diets are unlikely to cause kidney damage – in spite of some breeders’ and owners’ beliefs that it does. Feeding Your Elderly small dog breed: Older small dog breeds (those who have reached the last 25 percent of their expected life span) are usually less active than adult dogs and pups. Thus, their energy requirements are reduced and they can gain weight easily if fed too much or fed a high-calorie diet. Some veterinarians recommend “senior” diets; foods high in nutrients but reduced in calories to keep senior small dog breeds at a healthy weight. How Often Should a Small Dog Breed be Fed? Begin by following the feeding instructions spelled out on the dog food package. Realize that these instructions are a starting point, and apply to all breeds of a certain weight. Your small breed is an individual and every dog is different. An overly thin small breed will have visible or easily felt ribs and hip bones may be visible. The waist and belly are obviously tucked up when viewed from the side. Increase food. Speak to your vet to find out if there are any underlying medical conditions causing your dog to be underweight. Just Right: The ribs should have just a little fat over them; you should be able to easily feel them with slight pressure. Your small breed should have a waist when viewed from above, and the belly should be tucked up when viewed from the side. Too Fat: If you can’t easily feel your small breed s ribs and can easily see fat covering them, he is too heavy. His waist is absent or barely visible when viewed from above, or his belly may hang. Decrease food. How often you feed your small breed depends on how old he is and his (or your) personal preference. Pups must be fed several times a day, usually three..The average adult small breed can be fed once or twice a day, in the morning, evening, or both. Many owners like the idea of feeding twice a day, while others find it inconvenient and opt to feed once a day. Toy puppies have a very rapid metabolism and may require four to six meals a day to avoid hypoglycemia, a life-threatening drop in blood sugar levels. By six months of age, most Toy pups can cut back to three or four meals a day. Dogs are creatures of habit, and seem to enjoy eating at the same time every day. Feeding your small breed pup at the same time every day helps establish eating habits and makes housebreaking easier. Pups usually need to urinate or defecate after eating. If you feed him at the same time every day, you can predict when nature calls. Note: Free-feeding, leaving food out for the small breed at all times, is not recommended because it can lead to excess weight gain. Dog owners are fortunate to live in an age where there is an increasing awareness about proper dog nutrition. We understand that there is not a one-size-fits-all approach to feeding dogs. Specialist diets, such as small breed dog food, large breed dog food and dog foods specialist formulated for active/working dogs allow us to match our dog to a nutritional plan that perfectly matches their age, weight, breed and overall lifestyle. If you are considering feeding a dedicated small breed dog food, it makes sense to first understand the basic principles of why your breed would benefit for a tailored feeding plan. As with humans, dogs all have varying degrees of dietary requirements. Olympic athletes may require double the volume of calories in comparison to an ‘average’ person even if they are the same age, weight and height. On this basis, feeding a dog on the wrong diet could lead to weight gain, weight loss or even more serious health and behavioural problems. Dedicated diets can be a great benefit to owners who are keen to make sure their dog is receiving the right nutrition to match their breed’s individual requirements. On this basis it would be worthwhile to investigate the options when it comes to selecting small breed dog food that has been specifically formulated to provide the proper nutrition for your dog.